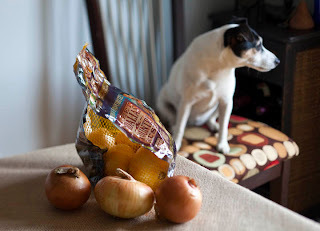 I was recently asked to develop some recipes for Sweet Georgia Vidalia Onions that would be printed on the back of their onion bags! I was so excited the Vidalia Onion Committee asked me to send some ideas and they would pick 6 or 8. So I did, I sent like 30 ideas. 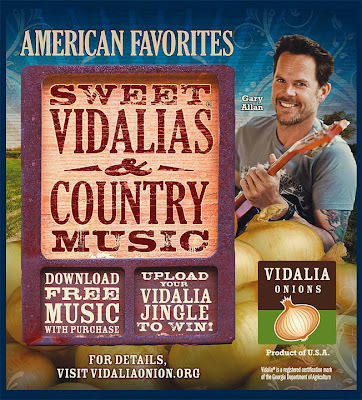 I mean, onions, sweet Vidalias, the possibilities are endless. They ended up loving my ideas and actually had me send them 10! I reworked some classics to highlight the “only grown in Georgia” onions and here is a sample. Although my name isn’t on the bag and the recipes were assigned to popular country music stars the recipes are great and there is a Jingle Contest you can enter to win a Nashville VIP Vacation Package or $1000.00. If you are not that musically inclined you can still download a free song and in my mind win with the Cheese Grits with Caramelized Vidalia Onions and Country Ham! Yum. Go pick up a bag! - Vidalias are defined to be only those that which have been produced in 13 counties and parts of 7 others, all in South Georgia. This region has the perfect combo of soil and weather to produce these unique onions. - Vidalias were developed on accident in the 1930’s by farmers hoping for a new cash crop with better profits during the Great Depression. -Vidalias are said to cause less crying due to their lower levels of sulfuric acid, which is a result of the lower levels of said volatile gas in the soil that they are produced. -Each seed variety is required to pass 3 years of testing before it is approved as a true Vidalia seed. -Vidalias are fat, cholesterol, and sodium free and a good source of vitamin C.
There is even a Museum dedicated to the history and process of this particular onion. If you find yourself driving through Vidalia, Georgia stop in and check it out. I have been working on this for many years. 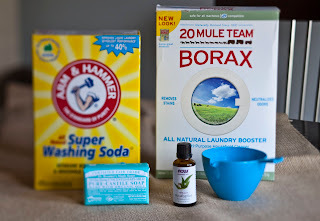 Trying to rid my house of toxic and in turn dangerous cleaners. It is hard to not reach for the Cascade, Oxi Clean, and Tilex because they work so well and with minimal effort. The problem is they are ridiculously toxic and poisonous and since I have a kid in the house it is a double no-no!!! Just because these items are in the store and available for purchase does not mean that they are safe. The long-term impact on your health and the health of the environment should supersede the convenience of these products. The beauty of what I am about to share with you is that along with being super easy, much better for you and the world around you, it is CHEAP!!!!! I don’t know about you but for a while I was buying the good laundry detergent that was earth friendly, non-toxic, biodegradable, etc. 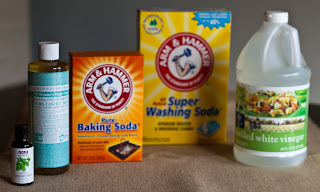 Then I moved on to all of the household cleaners; toilet scrub, all-purpose cleaner, bathroom cleaner, dish soap, dishwasher detergent, and holy crap, it is SO expensive. At first I didn’t care, I had a new baby, I had wanted to do it anyways but geez, I can’t afford this! 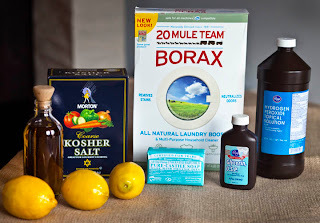 So I started doing some research and asking people and my friend Carmi gave me this recipe for laundry detergent and some other basic cleaners. Thanks to Carmi, I now only use these cleaners, I feel good about it, and I am saving a ton of money. I will be honest though, you will have to use a little more elbow grease than with the store bought cleaners but it is worth it. Seriously, I went to the store today and spent $24.74 on the ingredients to make everything and these things will last me the good part of the year if not longer…no joke—(you will spend a little more initially to buy your bucket and spray bottles and such, like $8 more, but the savings is unreal). Try it! Truly the other cool thing is that with basically 5 ingredients you can clean your whole house. Some more specific cleaners call for other ingredients, most of which you will have in your pantry or medicine cabinet, but the Essential 5 will take you pretty far! Using the grater attachment in your food processor or cheese grater, grate the bar of soap. In a medium saucepan, combine the grated soap and water over medium low heat. Stir occasionally until all of the soap is melted. 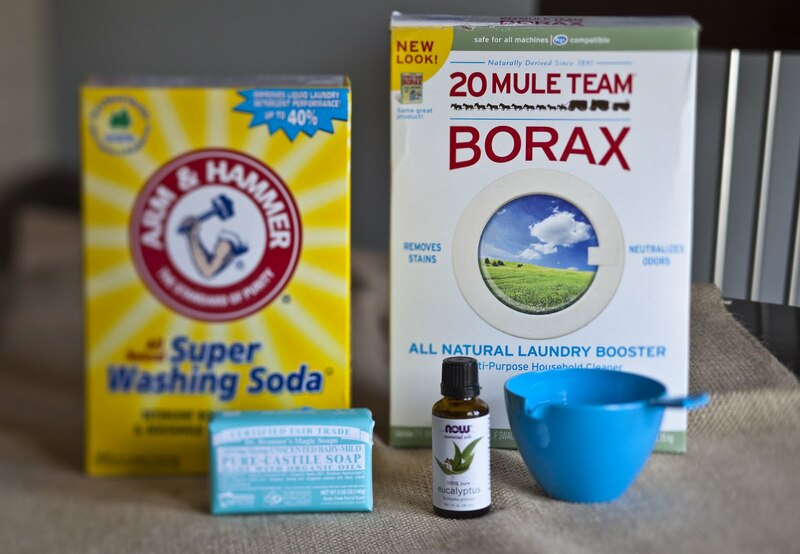 Add 2 ½ gallons of hot tap water to the 5 gallon bucket and add the melted soap, washing soda, and Borax. Fill the bucket almost to the top with more hot tap water and stir to thoroughly combine. Cover and allow to sit over night (it will thicken up, I keep a large spoon in the bucket to mix it up when it is time to refill my bottle). Once the detergent has cooled add 10-15 drops of your preferred essential oil. I keep a measuring cup and funnel next to the bucket and use an old liquid laundry detergent bottle to keep in my laundry room. Mix all of the ingredients in a 32oz. spray bottle. Use for shower, tub, counters, and bathroom floors, even toilets. Mix all ingredients together and store in a squirt bottle. Combine all ingredients into a paste. Use on sinks and tubs. Mix together and mop away! Sprinkle toilets with baking soda then sprinkle with distilled white vinegar and allow to sit for about 30 minutes then scrub with a toilet brush. You can also Sprinkle with baking soda then spray with all-purpose cleaner and allow to sit then scrub. Combine all the ingredients to make a paste. Spread on all to oven surfaces except heat element and allow to sit over night. Scrape off paste and wipe clean with a moist towel. Use steel wool for tough spots. If all of this is not enough for you to love these cleaners look at their labels and look up online at all the other things you can do with them from brushing your teeth to killing ants. I have done a lot of things in my life, most of which I am proud of, some not. I try to always do my best and be productive and successful. I could list these things but really none of them compare. The thing that I am most proud of, the thing that I feel I have truly put all I have into is being a mom. As challenging as it may be to be pregnant, breastfeed, go through sleepless nights, and really give up the only way of life you know to take care of a baby, it is rewarding in a way that can really not be described. Especially the first time your kid puts their fat baby arms around your neck and squeezes with all of their might and says "I wub you mommy". It makes all the bad stuff go away. So, I say this Mother's Day don't just tell your mom you love her, show your mom that you love her. The first thing that comes to my mind, of course, is with food. Cooking for someone and sharing time together are some of the most loving things that you can do. Food brings people together and just oozes with love. If you can't really cook, try. Anything will work, go simple. It isn't necessarily about the food itself, it is about the expression involved. The food is the vehicle. My mom has been an inspiration to me. She cooked for us almost every night even though she worked full time. She was always trying new things and teaching me along the way. When I go to see her, the first question is usually "Are you hungry”? Always wanting to nurture. The best compliment I ever got was when my mom called me one day to ask me a cooking question. She was asking ME??? She was the one I always called. I felt so proud. Thank you mom, I love you. Happy Mother's Day to all the Mothers and to all the rest of you out there, go feed your moms! 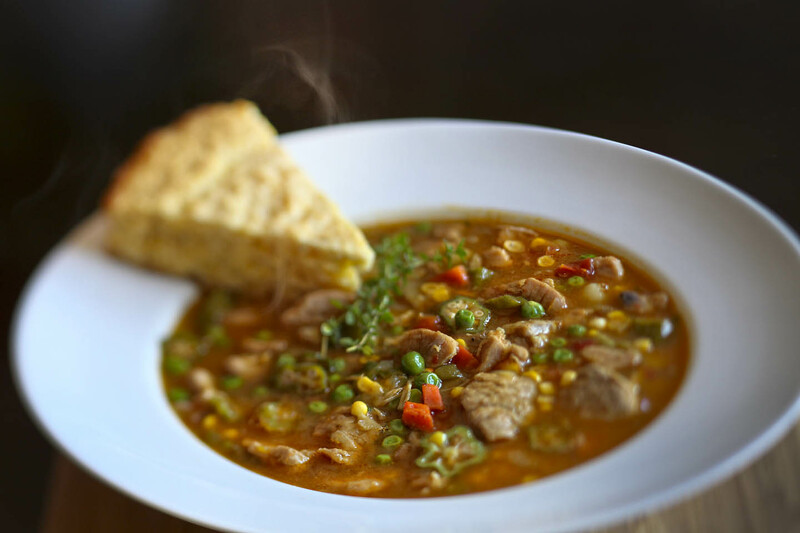 New School Burgoo: Burgoo is like Kentucky's version of Gumbo. Typically it is made with whatever meat is available and whatever vegetables you have on hand. It is sometimes made into a gathering where people get together and bring different ingredients to throw into the pot and hang out while it cooks for hours. Back in the day they would use game meats including opossum and squirrel. Since the grocery store didn't have either of these in stock I opted for pork and chicken. Burgoo usually uses smoked meats but I added smoked paprika instead because frankly, I don't have the time to smoke the meats. Also, it typically cooks for hours on end but again, I don't have the time so I made this one a quick version, using the same traditional ingredients in a new school way. 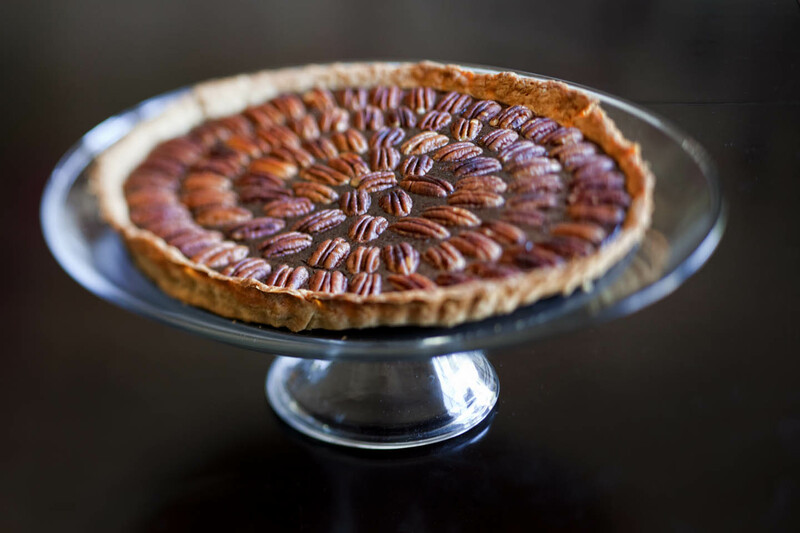 Chocolate Pecan Bourbon Tart: Derby Pie was created in 1950 by the family that owned The Melrose Inn in Prospect, Kentucky. I am assuming it was created as a special dessert for the event. 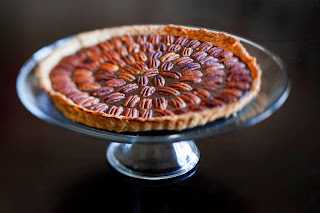 In any case they used walnuts but I always think of pecans so here is my version of Derby Pie (which is trademarked by the way) so I am calling mine Chocolate Pecan Bourbon Tart so as to avoid any legal issues. Oh, and I added bourbon because, well I like liquor. 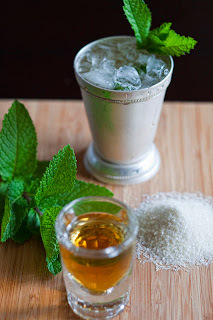 Mint Julep: This drink originated in the South and I am not sure exactly why it is the official drink of the Derby but it is delicious and refreshing. I chose to use Ancient Age Kentucky Bourbon because it reminds my of my grandfather Pop Pop. It was his bourbon of choice. Like champagne it can only be called bourbon if it is made in the county of Bourbon, Kentucky. Bourbons are usually made of corn, barrel aged in oak, and aged for a minimum of 2 years. Heat 2 tablespoons oil in a large pot set over medium high heat. Brown the meat on all sides, working in batches, season each batch with salt and pepper, then remove and set aside. This should take about 6-8 minutes per batch, add more oil if necessary between batches. After the last batch of meat has been removed from the pan add the onions,carrots and bell peppers. Cook until the vegetables begin to soften, about 8 minutes. Add the garlic and cook a few minutes more. Add the meat back to the pan as well as the potatoes, tomatoes, corn, lima beans, broth, bay leaves, brown sugar, cinnamon, nutmeg, and paprika. Bring to a boil then turn heat down to medium-medium low and simmer for 20-25 minutes or until the meat is cooked through and the potatoes are tender. During the last 5 minutes of cooking add the okra and peas. Taste and season with more salt and pepper. 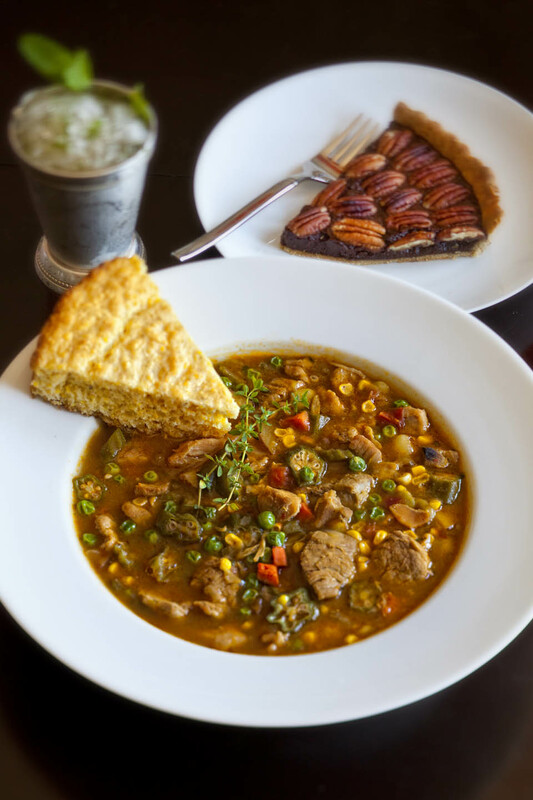 Stir in the fresh thyme and serve with corn bread. If you would like it thicker you can add 1/2 cup pureed cooked lima beans, if you would like it spicy, add some cayenne or hot sauce. 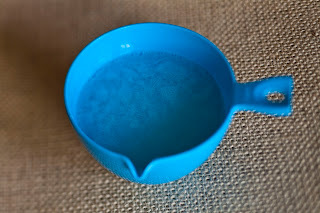 In a small sauce pan combine sugar and water over medium heat and stir until the sugar dissolves. Remove from the heat and allow to cool. Store any unused syrup in the refrigerator for up to 2 weeks. In a Boston shaker combine mint, bourbon, ice and about 1 tablespoon of simple syrup. Shake hard. 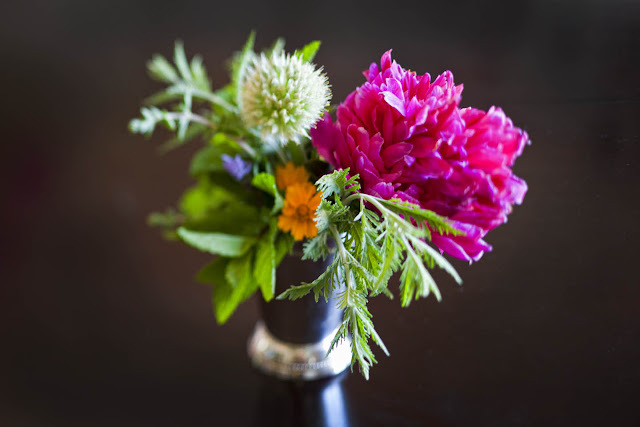 Pour into a julep cup and garnish with mint sprig. Enjoy, responsibly. So the first thing that comes to my mind when I think about Cinco de Mayo is of course (if you know me you already know what I am going to say): TEQUILA. The second is: TACOS. Although it is sometimes thought to be Mexico's Independence Day it is not, that actually falls on September 16. A brief history of Cinco de Mayo is in very short, a celebration of Mexico's victory over the French in the Battle of Puebla on May 5,1862. It is celebrated mainly in the state of Puebla and the United States. 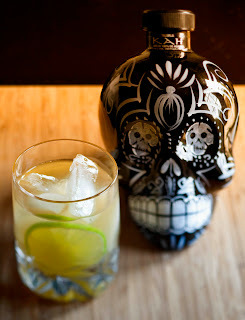 I like this holiday not only for the tequila but for the feeling I get around this time. It is kinda the marker for summer for me. Warm weather, sitting out on patios, festivals, the pool, vacation, I could go on and on. 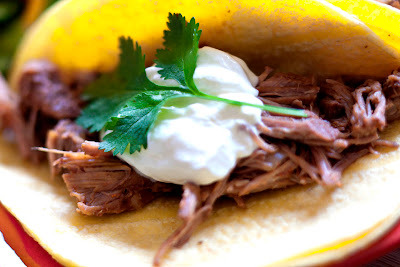 Since it falls on a weekday this year I thought I would give you an easy taco recipe that you can start in the morning and enjoy with your tequila when you get home from work. I am also pairing a killer tequila with it. 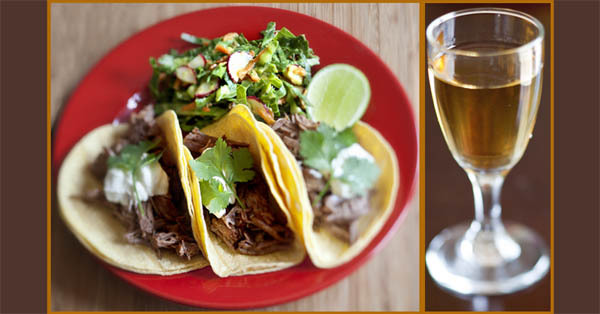 Mmmm tequila and tacos, perfect weeknight dinner. I had originally asked The local Tequila Guru: Michael Cook of Bone Garden Cantina which tequila I should highlight and he said Siete Leguas Blanco because it's story tied to one of the historical figures, General Francisco Villa aka: Pancho Villa, who was a hero involved in the Revolution, but I could not find it at 3 different liquor stores. 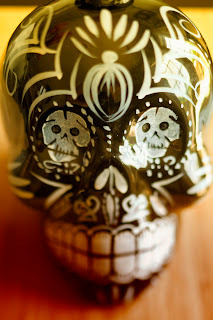 So I opted for Kah Tequila Anjeo, a tequila I have had before and liked very much and one that comes in a sweet bottle (although more reminiscent of the Day of the Dead which is celebrated October 31-November 3). AND, is certified organic. It just became available recently and should be tasted. I could give you some descriptions of the tequila, (aromas of coffee, chocolate & tobacco, blah, blah, blah) but I know that if you go visit Michael at Bone Garden he will school you on anything you could ever want to know about almost any tequila you have ever encountered. He is like a tequila sommelier…is there such a thing? In any case, I feel that you should only drink good tequila and it should be enjoyed neat, however if you are afraid, normally I would say "face your fears", but I have also included a "margarita" so to speak to soften the blow. But really, I would never suggest tequila that shouldn't be drunk without the training wheels. Please enjoy, responsibly. In a large crock pot combine all ingredients except orange zest and toss well to combine. Cook on low for 8-10 hours and high for 4-6. Once the meat is finished add the orange zest. Pull the meat from the liquid and shred with two forks. Serve on doubled corn tortillas that you have warmed in a damp paper towels in the microwave. Serve with sour cream, lime wedges, and fresh cilantro. In a large bowl combine everything for the slaw. In a small glass jar combine all ingredients for the vinaigrette and shake to emulsify. 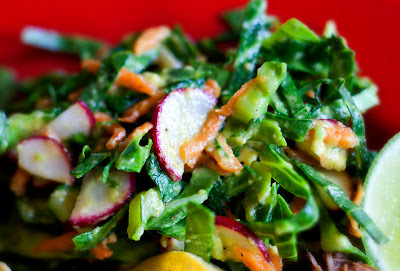 Dress the slaw with all but 2 tablespoons of the vinaigrette and allow to marinate for at least an hour. This can be made a day ahead. It actually gets better with age. Serve with Cinco de Mayo Beef Tacos. In a rocks glass combine all ingredients over ice and enjoy.